Oils seal - this is 9MM double lipped, which is what Suzuki fits. Not 8mm or 7mm supplied as standard in many kits. Fits all Suzuki Jimny models and years. Kit consisting of TWO Kingpin bearings and ONE axle oil seal. This kit consists of the parts needed to change the Kingpin bearings on one side of the front axle. 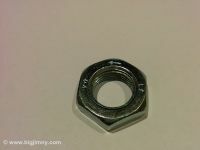 It contains a pair of 30302J Bearings and a 26 x 38 x 9 R23 Oil Seal which is the small one that fits inside the axle end. 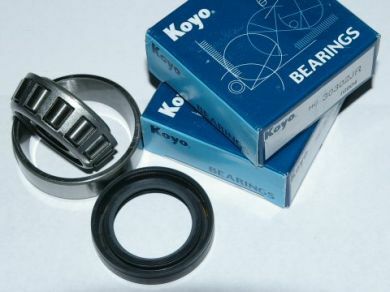 This kit consists of the genuine Koyo Bearings, as fitted by Suzuki. These are not "white box" or Chinese copies or equivalent brands. This kit contains the SAME bearing as the Suzuki 09265-15006 bearings and 09283-26016 Oil Seal. This kit also fits a broad selection of the SJ Suzuki range as well. In conjunction with a local garage I can now recommend a fitting service. The garage is located near Maidenhead, Berkshire. You will deal direct with the garage and will pay them on completion. Based on stuck and corroded bolts a safe estimate is 2 hours to fit which at their rate comes out at around £100, a simpler fit may be cheaper. The engineers are Suzuki experienced, indeed the local Suzuki dealer has been known to contact them for assistance.